So I just got done blogging about Stanley Kubrick's last film Eyes Wide Shut but that was not his first film to tackle the top of mind control. 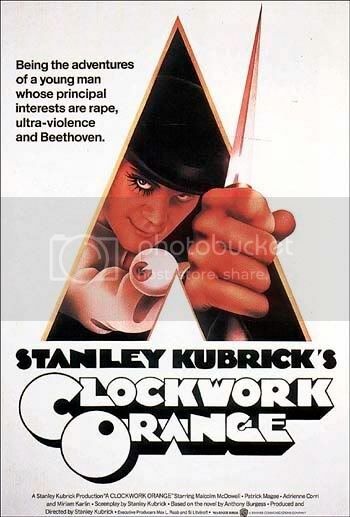 I'm sure most of you know of the cult classic A Clockwork Orange. The film is basically about a street criminal who is arrested and while in jail is recruited by the government to undergo mind control experiments (known as Classical Conditioning) and in return he'll be set free. Here's a clip from the film. What I find interesting is that this film, about mind control, has been referenced by a lot of my suspected famous mind control victims. For starters, here's Christina Aguilera and her Jewish handler...I mean husband, at some party, dressed as the characters in A Clockwork Orange. Kylie Minogue took it to the extreme with this performance. There's the Beethoven at the beginning, the Clockwork outfits, there's even a hypnotizing spiral that I explained here. By the way the "mirror ball" or disco ball is something I need to discuss soon. It has been used by Kylie, Madonna, and Beyonce for a reason. Hint: it is fractured. Usher also used the Clockwork Orange theme for his video for "My Way". Click here to watch it.